The second round of the championship saw the team make some adjustments to the set-up of the all-new 2017 GSX-R1000, aimed at helping the Nottinghamshire rider with corner entry. The changes proved positive and allowed Cooper to win the first race of the weekend, after he hit the front early on and led the way until the red flags came out because of rain falling at the Kent circuit. For today’s race, the team made more changes to try and further improve the bike that unfortunately didn’t yield the same gains. 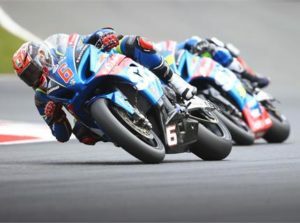 However, he was still able to race to another podium finish, taking third place after a race-long battle at the front which saw six riders covered by just two seconds at the chequered flag. It means Cooper and the new GSX-R1000 have finished on the podium in every Superstock 1000 race so far this season.